You can walk around and interact in digital worlds and fantastical environments with HTC VIVE Virtual Reality System. Putting on the VIVE headset washes away the real world with fantastical experiences–from games like first-person shooter or 360˚ painting. SteamVR™ Tracking, stunning graphics, a 360˚ field of view, intuitive controls and HD haptic feedback provide an unparalleled sense of immersion. VIVE is built from the ground up for room-scale VR, which allows you to physically move around objects in the virtual space. 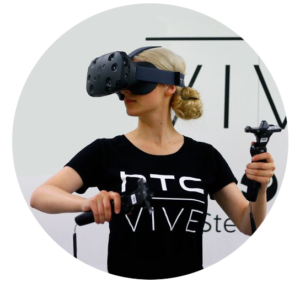 An adjustable headset and multiple eye relief adjustments, including lens distance and IPD, to make Vive comfortable and clear. Wireless controllers designed specifically for VR make interactions with objects natural and intuitive. Enjoy a safe, convenient experience with Chaperone bounds of your play area, a front-facing camera. Choose from one of three VR experiences (more info below): Google Tilt-Brush, Google Earth VR, and Space Pirate Trainer. Book your experience today! $20 / 30 min. session. Maximum 2 people per session.